It has been announced that the Atherstone and Quorn are to De-commission today the 14th December 2017. Our apologies for the lateness of posting the above letter from the CO of HMS Atherstone. It slipped down a crack. I hope this letter finds you and all of the Ton Class Association in excellent health and starting to enjoy some Summer weather. I am writing as the Commanding Officer of HMS ATHERSTONE, although I hope you remember me as the Commanding Officer of HMS CATTISTOCK from June – December 3013. You may recall myself and Crew 2 of the Second Mine Countermeasure Squadron (MCM2 Crew 2) were to deploy to the Persian Gulf onboard HMS ATHERSTONE for seven months from December 3013 to July 2013. Our time onboard HMS ATHERSTONE is now drawing to a close and I am pleased to report that it has been very successful. The reason that I write to you now is that (after a well earned period of post-deployment leave) MCM2 Crew 2 will be returning to HMS CATTISTOCK and I am keen to renew our affiliation. We will find ourselves in an unusual position in the UKI as HMS CATTISTOCK herself will be in dry dock receiving an extensive refit. You may have heard about this refit before, but it is designed to improve her efficiency and capabilities and to extend her life by at least another decade. This refit means that unfortunately we will not be in a position to bring HMS CATTISTOCK herself to visit ports until mid-2015 at the earliest. However despite a lack of a sea-going ship, MCM2 Crew2 will not be idle. The time spent in Portsmouth Naval Base represents a rare period of shore time which will be filled with professional courses, exams and training. It will also involve supporting the other Crews of the Second Mine Countermeasure Squadron in their duties. If there are any events coming up in the South Coast area from mid-August onwards (the end of our post deployment leave) that you would like us to try and support or attend then please write to us to let us know. Letters addressed to myself at HMS CATTISTOCK. BFPO 251 should always find their way to me. Affiliations are extremely important to the Royal Navy and I hope this period of time alongside gives us the opportunity to renew ours. I look forward to hearing from you and I will write again when MCM2 Crew 2 are re-established in Portsmouth. I hope to be able to invite you and some of your members onboard HMS CATTISTOCK when we move on board her. HMS Atherstone’s new crew started their latest Bahrain-based deployment with a joint RN and US Navy Mine Counter Measures Vessels (MCMV) exercise which practised the ship’s ability to work with allies in the Gulf. The 43 officers and men of Crew 2 of the Second Mine Counter Measures Squadron flew to Bahrain to take over HMS Atherstone in early December. On arrival, the Crew familiarised themselves with their new ship and the local maritime environment. HMS Atherstone is one of four MCMVs permanently deployed to the Gulf. Her Crew will remain in the region for seven months conducting route survey operations and a number of exercises with partner nations. They proved themselves ‘fully mission capable’ during Basic Operational Sea Training (BOST) on the Clyde, Faslane; and during Exercise Joint Warrior off the west coast of Scotland during September and October last year. With the exercise complete, the Crew spent Christmas Day alongside and, given the warm Gulf conditions, opted for a barbecue rather than a traditional roast. Father Christmas also visited the ship and handed out Christmas Boxes from the UK4U Charity as well as gift boxes organised by the Support our Soldiers charity from groups such as the Sea Scouts and Sea Cadets, all of which were warmly appreciated by all onboard. 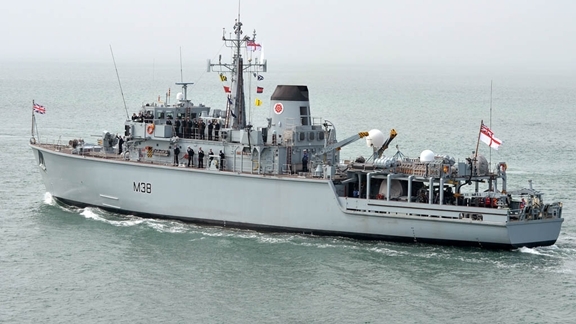 More than 100 visitors were invited on board the Bahrain based Mine Counter Measure Vessel (MCMV) HMS Atherstone as part of events marking the island’s British Embassy sponsored “Great British Week”. The visit was organised by the UK Maritime Component Command (UKMCC) in coordination with the UK’s Defence Attaché to Bahrain. The visitors, who included students from St Christopher’s School, Manama, and members of the British Club, boarded HMS Atherstone for a guided tour of the vessel. “Events such as these are all about promoting the UK in Bahrain,” said Lt Cdr Andy Smith, HMS Atherstone’s Commanding Officer. “The Royal Navy has maintained a presence in the Middle East for 30 years and we have had a permanent presence in Bahrain since 2003. “Inviting members of the local community on board allows us to demonstrate our many capabilities and show how we operate,” he said. “By working with our allies in the region, we promote our partnerships with those nations and together we ensure security and stability in the region ” Lt Cdr Smith added. The ship, which has been based in Bahrain since June 2012, is one of four Royal Navy Mine Counter-Measure Vessels based at Mina Salman port near the capital, Manama. HMS Atherstone is equipped with a Sea Fox mine disposal system and has around 45 Ship’s Company, including highly trained divers, weapon engineers and mine warfare specialists.